Yesterday I get two spures from this new set for to paint. The set will certainly please the friends of antiquity and especially the Romans. Because these are Ancient Germans. So far, there were only four Germanic sets of Strelets (2x), Caesar Miniatures and HÄT. Personally, I'm impressed with the miniatures and I like the quality. On a sprue are 12 figures in different poses. Here you can see the blanks and in a few days they will be shown painted in a new preview video in my video-channel. Some suggestions for appropriate corrections if still possible at this stage. 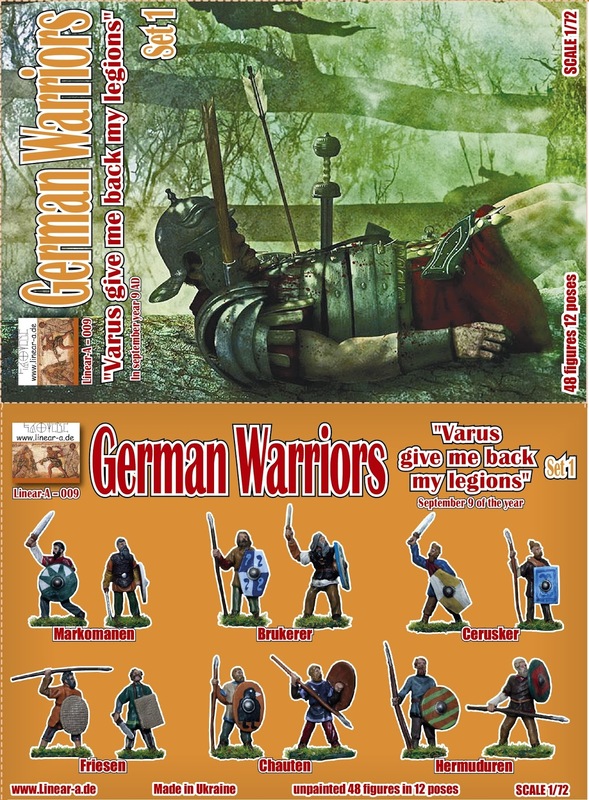 If Linear-A decides to stick to an english description on the box (which is fine), it should read “Germanic Warriors“, not “German“. These people were quite far away from defining themselves as “Deutsche“, but were all “Germanen“. The time specification is misleading. In english language, “vor Christus, ante Christum“ translates into “BC“, not “AD“ which means “nach Christus, post Christum, but also anno Domini in latin“. I think the designer got confused between latin and literally translating modern german into english language. So, “Battle of Teutoburg Forest, 9 BC“ would be a reasonable box art description I suggest. For the details on the depicted tribes I would keep the german designations (just as they did). Best regards and good luck to Linear-A with their interisting projects! Will definitely buy a box myself. Erich von Manstein wrote: The time specification is misleading. In english language, “vor Christus, ante Christum“ translates into “BC“, not “AD“ which means “nach Christus, post Christum, but also anno Domini in latin“. the battle happened in 9 AD...(or, more preferrable, 9 CE =Common Era), 9 years after the conception/birth of Christ, so as you´ve correctly written, Anno Domini. In the year 9 AD, a military tragedy occurred in Germania. Paul wrote: :eh: the battle happened in 9 AD...(or, more preferrable, 9 CE =Common Era), 9 years after the conception/birth of Christ, so as you´ve correctly written, Anno Domini. Still, the description on the back of the box is a little confusing. “September 9 of the year“ makes not much sense. “9 AD“ would do. Hope my remarks on “germanic“ vs “german“ will pass any further investigations though… . I´ll Definately second Germanic Warriors over German warriors. Erich von Manstein wrote: Some suggestions for appropriate corrections if still possible at this stage. It's really good to see Tom's figures on the back of the box, I think those guys probably called it "The year we gave the Romans a good spanking". "Quinctilius Varus, give me back my Legions!" ?